When Orange (News - Alert) Business Services wanted to boost its fleet management service, it turned to MobileIron, which now drives Orange’s Device Management Premium. This service is designed for large fleets, those with over 300 units, and manages all the smartphones as well as tablets, which are now used in increasing numbers. “The partnership with MobileIron takes the existing offer beyond traditional mobile fleet management functions – user profile and device management, security policy application, configuration of embedded apps, mobile personalization – to offer an advanced, highly secure version of the solution,” Orange explained. The service, leveraging the MobileIron flexibility, can work in cloud or as a private installation. Fleets don’t always run on company-issued computing tools, but often have to accommodate BYOD. Here the Orange flavor of MDM service can keep business and personal applications and related data entirely separate, and the business data encrypted. The system also provides content management so that mobile workers – and fleet workers sure are mobile – can access company documents safely on their mobile device. 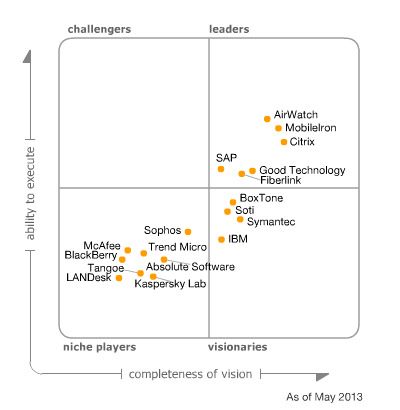 Most every vendor wants to be in Gartner’s Magic Quadrant; the upper right-hand square is the place to be. To get there, you must combine leadership, vision and ability to execute. And that is just the square that MobileIron sits in. This isn’t the company’s first time at the rodeo. “The vendor has been in the Leaders quadrant in the Magic Quadrant for Mobile Device Management Software for the previous two years now. It has driven its success through many channel partners and delivers its solution mainly through its appliance globally. In 2012, it had another strong sales year and is one of the top five MDM vendors in terms of sales revenue and number of mobile devices supported. It has a very strong vision for enterprise mobility and has developed or acquired the technology to deliver. It has executed well in sales, support and customer service,” Gartner explained. IDC (News - Alert) Likes It Too! IDC found MobileIron to be achieving fast growth based on its pure focus on MDM. The key to MobileIron's rapid growth has been its channel strategy. The company achieves 100 percent of revenue through indirect sales. This channel includes a network of 180 partners that can resell MobileIron software across over 40 countries. Its resellers include 13 tier 1 mobile operators and over 160 mobile systems integrators and VARs.